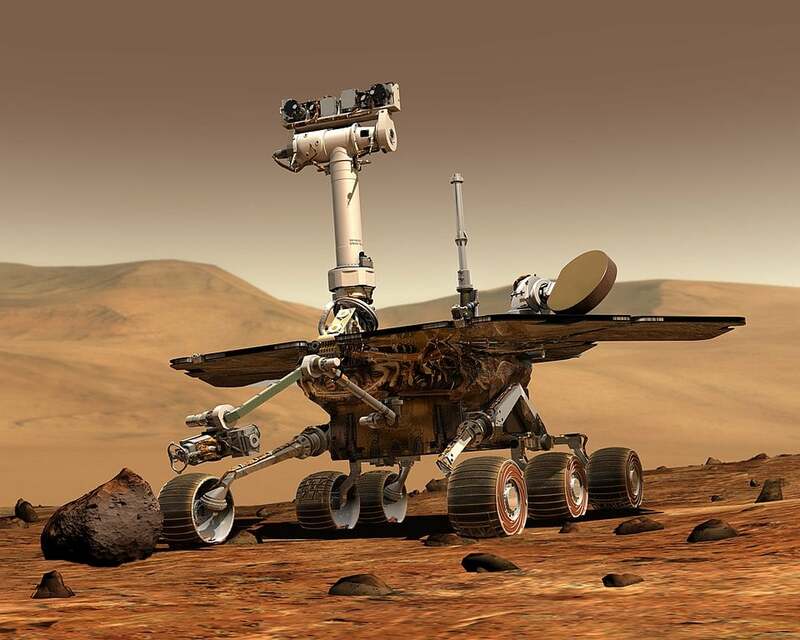 NASA’s now-silent Opportunity rover has now marked 15 years on Mars after landing on the planet on Jan. 24, 2004. The rover touched down in a region called Meridiani Planum and sent its first signal to Earth on Jan. 25, 2004 at 12:05 a.m. Eastern. The rover has been credited with many discoveries on the Red Planet. As Opportunity begins its 16th year on the Martian surface, it’s in sleep mode, which it entered when a global storm caused its solar panels to be covered by dust in June 2018. NASA designed the golf-cart-sized rover to travel about 1,000 yards and survive on the planet for 90 Martian days, also known as “sols.” However, the now-silent Opportunity rover managed to greatly exceed the original expectations. In February 2018, the rover had traversed more than 28 miles in an astonishing 5,000 Martian days. “Fifteen years on the surface of Mars is testament not only to a magnificent machine of exploration but the dedicated and talented team behind it that has allowed us to expand our discovery space of the Red Planet,” Opportunity Project Manager John Callas of NASA’s Jet Propulsion Laboratory said in a statement. “However, this anniversary cannot help but be a little bittersweet as at present we don’t know the rover’s status. We are doing everything in our power to communicate with Opportunity, but as time goes on, the probability of a successful contact with the rover continues to diminish,” he added. It has been a long time since Opportunity connected with Earth. The last signal received by NASA was on June 10, 2018. That’s when a global dust storm enveloped the planet, obscuring the rover’s location and coating its solar panels in dust. Those solar panels keep the rover charged so it can move around. Nevertheless, NASA doesn’t want to give up on the rover, so its mission continues. The agency’s Jet Propulsion Laboratory (JPL) has been sending commands to the rover, which it could respond to eventually — perhaps. NASA is also listening for hidden signals from the silent Opportunity rover in hopes that its life isn’t finished after 15 years on Mars. If they hear from the rover somehow, they could attempt a recovery. Opportunity was launched with another rover called Spirit from Cape Canaveral, Florida in 2003. They landed together in 2004, but Spirit’s mission ended in 2011 after NASA lost communication with it despite many attempts to recover it. Hopefully the Opportunity rover doesn’t meet the same fate. The skies of Mars have now cleared, allowing sunlight to penetrate the atmosphere and possibly recharge it. “The Sun is breaking through the haze over Perseverance Valley, and soon there will be enough sunlight present that Opportunity should be able to recharge its batteries,” Callas said in a recent update on the rover’s status.